In preparation for New Years Day tomorrow, I present to you: a Hangover Busting Smoothie Recipe. You’re welcome. 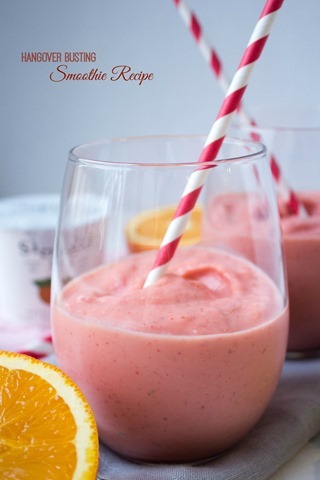 Whether you overindulge tonight or not, you’ll love this smoothie. Packed with protein and vitamins, it’s the perfect refreshing and healthy way to start off the new year! 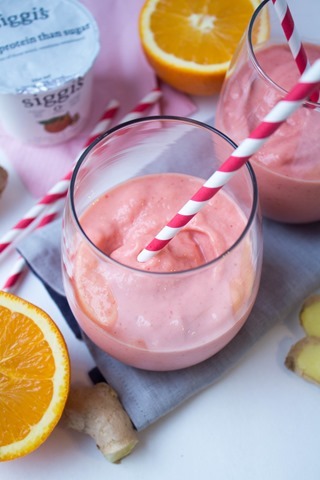 This recipe features siggi’s yogurt, which is one of my fave yogurt brands because they don’t contain any artificial preservatives, thickeners, sweeteners, flavors, or colors. 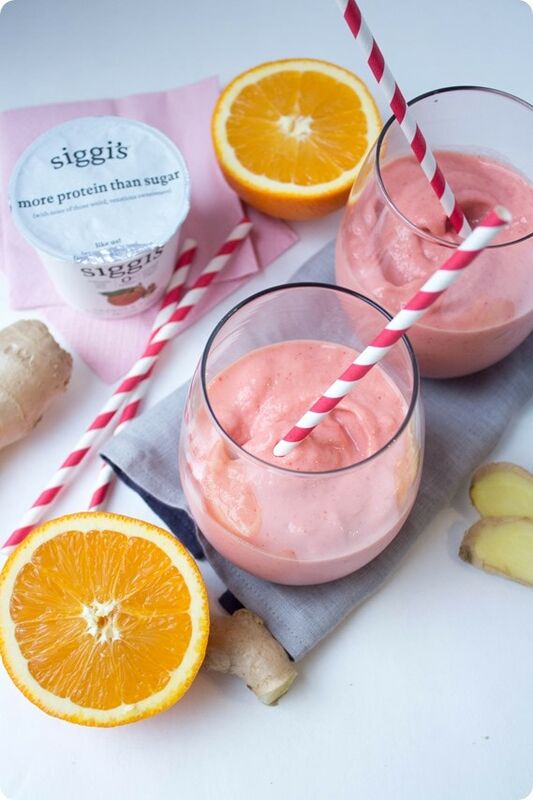 Each container of siggi’s also has more protein than sugar, which is perfect for keeping you full. Their orange & ginger yogurt is my favorite – and also the perfect fit for this hangover busting smoothie because of the ginger, which helps combat nausea! I threw in some extra fresh ginger to amp up the flavor (and hangover busting qualities), too. The other key to this smoothie is the thirst quenching coconut water. Coconut water is high in electrolytes like potassium, which helps regulate the hydration of your cells to reverse the dehydration that alcohol causes. Finish off the smoothie with some fruit to add flavor and a boost of vitamins and you’ll be back on the right track, health-wise, in no time. Here’s the recipe. Happy blending – enjoy! 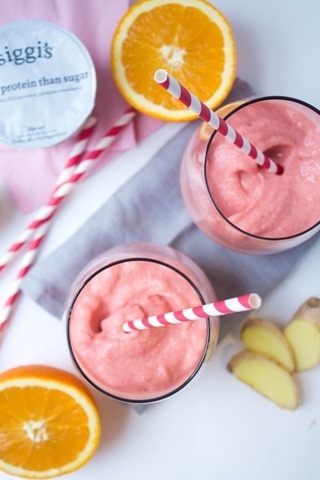 This smoothie is packed with protein, ginger, and vitamins for a delicious and healthy hangover cure. Combine all ingredients in a blender (if using fresh instead of frozen fruit, add a handful of ice) and blend until smooth. Serve immediately. This is a sponsored conversation written by me on behalf of siggi’s Dairy. The opinions and text are all mine. 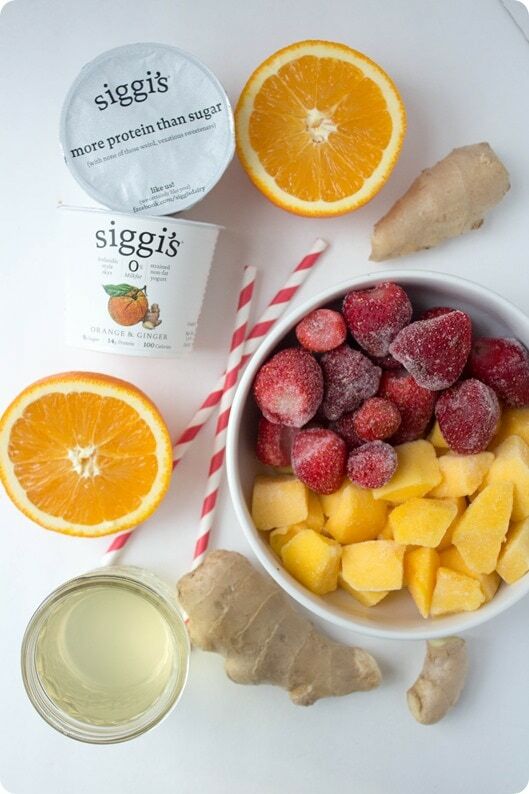 siggi’s rather delicious yogurts have simple ingredients and not a lot of sugar. Try delicious flavors like vanilla, pumpkin & spice, and mixed berries & açai, power up your breakfast with their recipes and print a coupon. I really like siggi’s yogurt as well! so delish. Love what you did with this recipe, incorporating fresh grated ginger. Hangover or not, this is sure to be made soon. Happy New Year. I LOVE this recipe! I probably won’t be hungover, but I will definitely be sipping this very soon – it has all my favorite things! love this! I love using siggis in recipes, especially as a siggis ambassador I try and be more creative :) but my fav is still this plain with cinnamon & fruit!! Didn’t need it, thankfully, but loved it just the same! Hope the cruise goes well! Nice pics from it! Your pictures are so awesome!! Happy New Year! Siggi’s makes orange and ginger yogurt? What the what?! Sign me up. I have become utterly obsessed with putting ginger on errrrything these past couple weeks: smoothies, yogurt bowls, oatmeal, as well as making ginger-packed dals. Can’t wait to try this recipe, Anne! Love that you serve the smoothies in wine glasses, too.